After yet another successful Alumni Weekend, Pittsburgh En Sabah Nur hosts their annual alumni game. The Alumni defeat the current team yet again 13-10. En Sabah Nur hosts their second Bubble Bowl in Pittsburgh. 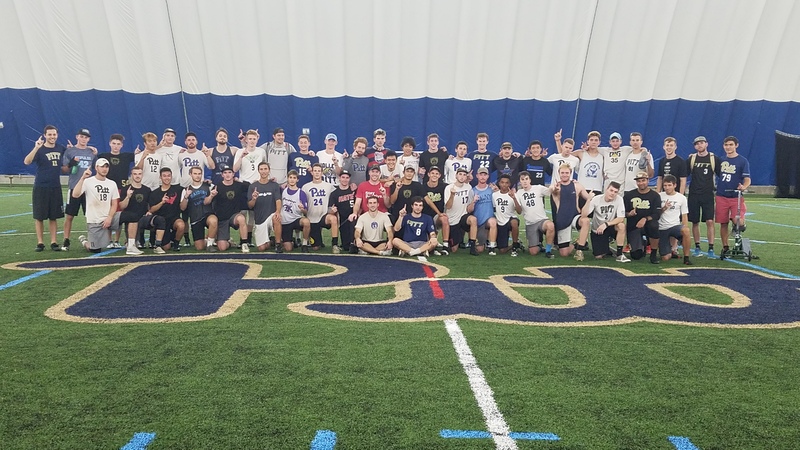 As winter break drew to a close, everyone was looking forward to the chance to play the first games of the season in the second annual Bubble Bowl, an indoor tournament we host in the new sports dome on campus. As the weekend drew closer, reports of a massive snowstorm headed to Pittsburgh disrupted our plan Bubble Bowl. Almost every team was forced to drop out to avoid traveling during the storm. The only teams still able to play in the Bubble Bowl were En Sabah Nur, Pitt B, and CMU. Luckily, a Pittsburgh Club team was put together last minute to be the fourth team at the tournament, allowing us to play a small round robin of games. Although the weather ruined the original plans of the Bubble Bowl, we were still able to get meaningful reps against tough competition that helped prepare us for the rest of our spring season. Game one of the Bubble Bowl was against CMU. The game started with trading holds until we decided to come out with a zone, yielding a turn and later the first break of the game. The one break was all we needed, and we rolled the rest of the way to a 14-6 victory over CMU. Our second game of the Bubble Bowl was against the Pittsburgh Club team, made up of players from Pittsburgh looking to get some reps in during the long Pittsburgh winter and club offseason, including a few recent En Sabah Nur alumni, such as Jimmy Towle, Thomas Edmonds, Dylan Best, Sam Van Dusen, and Kyle Hartley. The first half had only one break, with Pittsburgh club breaking to take a 2-4 lead. We traded holds for the rest of the first half and went into halftime down 6-8. Needing breaks to get back into the game, we attempted a zone in the second half to try and generate more turns. The variety of skilled throwers on Pittsburgh Club allowed them to easily pick apart the zone every time and score. Both teams continued to hold until, down 12-14, a miscue gave Pittsburgh club an opportunity to break and win, which they did off of a huge deep shot. Our final game of the first day was against our own brothers, the Pitt B team. We jumped out to a hot start, stringing together four breaks to take an early 4-0 lead. After that, Pitt B came storming back, tying the score at 7-7 before we took half 8-7. In the second half we were able to stifle Pitt B’s offense and cruised to a 15-9 win. The Program, top to bottom, is looking strong. Day 2 of the Bubble Bowl saw the boys playing against CMU again. This game panned out much like the previous days matchup. Our zone was able to generate great pressure and eventually lead to breaks, while our offense played cleanly and did not give up a break for the whole game, leading to a final score of 13-8. 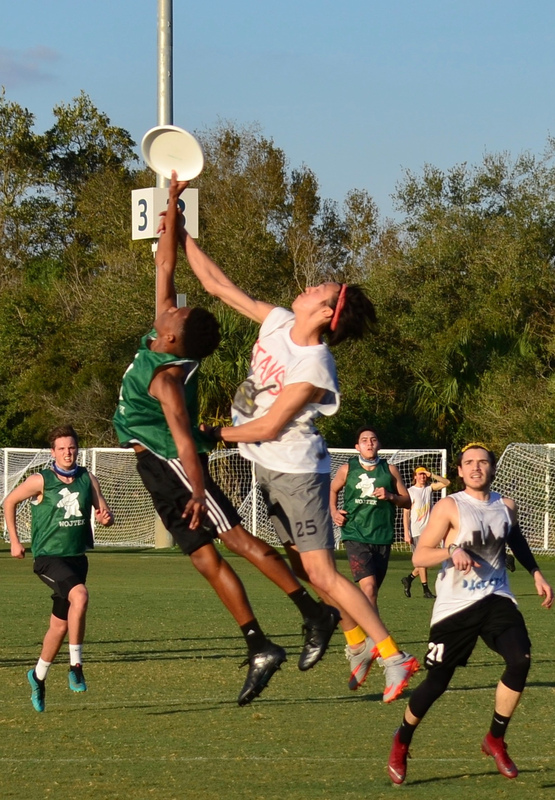 On February 8th, En Sabah Nur escaped the cold, rain, and snow of Pittsburgh, and flew down to Tampa, Florida for Warm Up, our first major tournament of the 2019 season. Pitt at Florida Warm Up with transfer Julius Hubby. We miss him. Max Thompson steps out for the throw. 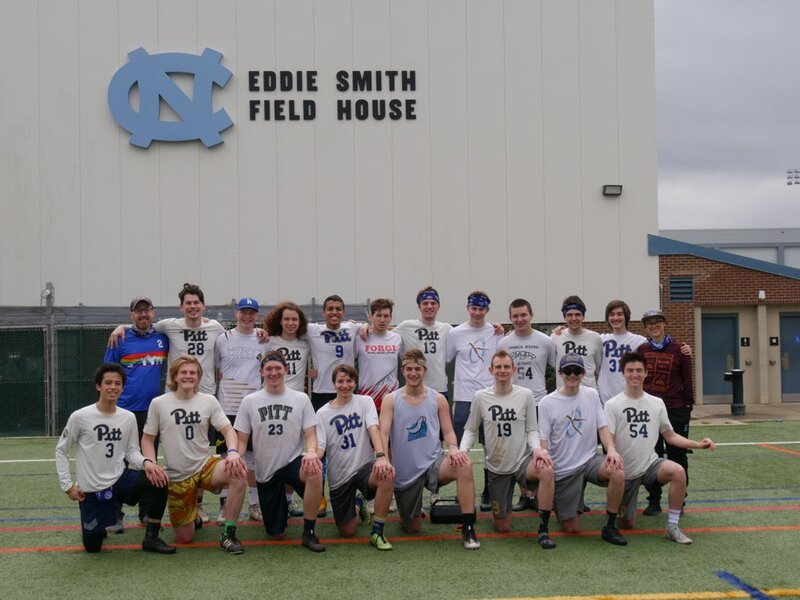 Our first game was against Northwestern, which ended with a convincing 13-7 win. The D-line provided high pressure all game, with some big bids from freshman Henry Ing and Sophomore Myles Cooper, and huge skys from sophomore Will Hoffenkamp. After a bye, we played the host team, South Florida, which ended in a quick 13-3 black sea victory. In the first rivalry game of the season, we started off trading holds with CUT to 6-6. We took the momentum going into halftime with the first break of the game off of a Michael Ing bookends. We traded a few more holds, until they tied it at 9-9 with a break of their own. We continued to trade until 12-11, and sent the D-line out for an opportunity to break for the win. After a marathon point, we scored on a huck, but a CUT player who was not involved in the play cramped up and called an injury, so the disc came back. A few more turnovers later, we were back on the doorstep of the endzone and scored with some patient offense. Freshman Aiden Landis led the offense with three goals and three assists, Fifth-year Andrew Lehmberg showed intense grit to get a run through D after dropping a potential game-winning goal, and sophomore Kevin Tsui got his first sky with a sweet two-handed jam over two CUT players. Pittsburgh and Carleton played the game of the day on Friday night, a rematch of the 2018 National semifinal game. The game didn’t feel like an early February tuneup between two teams looking to ready themselves for Nationals. It was a back-and-forth heavyweight battle that both teams clearly wanted to win. The first half was comprised almost entirely of holds, though both clubs missed out on multiple break chances. The first and only break of the half wasn’t taken until the final point of the half, when Michael Ing showed off why he’s one of the best players in the country. Ing got a deep block in one-on-one coverage, commanded the offense to start the possession, and then took off deep for the huck score to get the break to take half at 7-6. Both teams traded haymakers in the second half, with Harry Wolff Landau particularly dangerous deep for Carleton. Leo Warren was pivotal in the Pitt backfield, feeding his army of athletic, tall cutters downfield. It was Carleton who got the first break of the half to make it 9-9 after Pittsburgh turned it over an a dropped under. They were left to rue a missed opportunity on the next point when Pitt turned on a misthrown huck but Carleton couldn’t capitalize. The teams traded holds to 12-11, in favor of Pittsburgh, with big plays from Warren and Kevin Tsui for Pitt and Wolff Landau and Stanley Birdsong for Carleton. With the game to 13, but still with win by two rules in effect, Pitt put out a ‘kill line,’ featuring Ing, Warren, and some other offensive mainstays. Pitt forced an early turn – a high stall punt – and worked the disc downfield before calling a timeout to set up the redzone offense. An easy drop in the endzone out of the timeout, though, gave Carleton another chance. Carleton coughed it up again, however, and Pitt appeared to have the game won on a huck to Warren, but an injury call brought the disc back. A quick exchange of turns led to another Pitt redzone opportunity. This time it was Ing who was able to escape from an exhausted Birdsong to get the game winning score, 13-11. For Pitt, the game was a cap to an all around impressive day. Freshman Henry Ing, Michael’s brother, was a two-way force, playing major minutes on both offense and defense. Their depth was impressive, too. The whole team was fast and played with an impressive level of intensity for an early season tournament. They were easily one of the two best teams on the day. Leo Warren gets up big against Brigham Young. Day two started off with a big game against BYU, who showed they are for real, despite not being able to attend Nationals due to religious reasons. The wind had picked up and challenged our throwers all day. We were up coming out of half, but they strung on a couple breaks to take the game to double game point. We received on DGP, but a short-field turnover by popping up a throw in the wind. Matt Hanna got a nice layout D in the endzone to get possession back, but we turned again. BYU was able to get back to the endzone and scored on a tipped pass. After a long three games to start the day, we played Texas under lights in quarterfinals. In another windy battle, they took the win 10-14. We had a few too many execution errors on offense and lacked defensive intensity to earn the disc back. It was a rough loss to take, but Texas showed us what we needed to work on to improve. Pitt entered the bracket as a heavy favorite to make the final. They’d looked like one of the two best teams of the tournament on Friday, and their one loss on Saturday – a double game point defeat to BYU – looked like little more than a tight loss against a fellow elite team that could easily have gone their way1. Texas, on the other hand, was blown out by Central Florida on Friday and had a couple close wins over teams that finished nowhere near the top bracket in LSU and Tufts Saturday morning. When Pitt got back to back breaks to start the game, it looked as though the game was headed for a comfortable Pitt win. Texas prevented the game from getting out of hand, though, by calling a timeout, and coming back with a clean hold for 2-1. They then instantly got one of the breaks back when some sloppiness began to creep into the Pitt offense and Gage Edblom made a huge layout grab in the endzone for a Texas score. The teams traded holds to a 5-4 Pitt lead, but the Pitt offense continued to show signs of vulnerability. Michael Ing had some unforced turnovers, and the whole offense had lapses of confusion and execution errors. Those issues compounded at the end of the half to the tune of a 4-0 run from Texas into the half. Pitt looked rattled and a little tired, and Texas brought an energy level you’d usually see in a bracket game at Nationals to overwhelm their opponents at the end of the half. The moment was never too big for them in the half, and they never came close to relinquishing their lead. Noah Chambers and Reese Bowman continued to make gravity-defying, momentum-seizing plays, and the Pitt defense couldn’t create enough problems for the Texas offense to get back in the game. The Texas club grabbed two more breaks in the second half and gave up none of their own to knock off Pitt by a well-earned five goal margin and advance to semifinals. Henry Ing goes up for the big sky. In the 5th place bracket we got to play against Julius Hubby, who transferred to UT-Dallas after his freshman year at PITT. We took the W in a close one, 12-10. 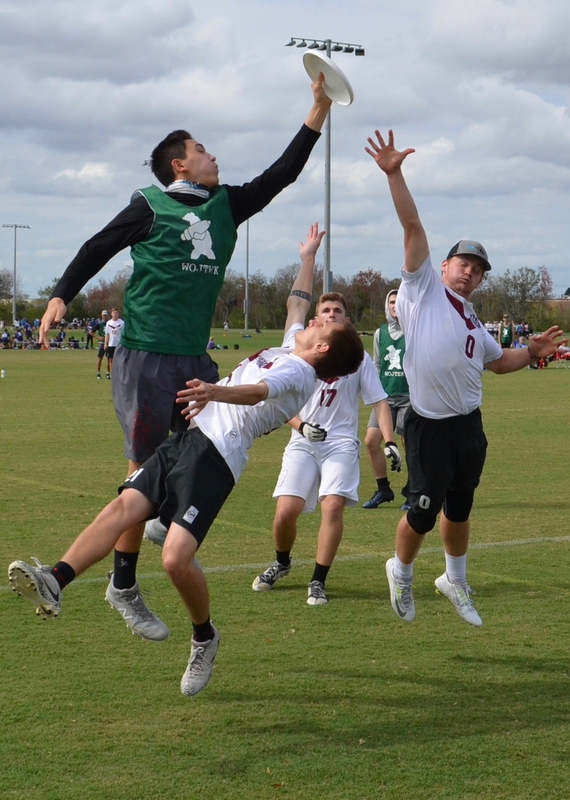 In the last game of the weekend, we got a comeback win against Texas A&M to take fifth place. Henry Ing put the team on his back and caught the last three goals for breaks as we won.